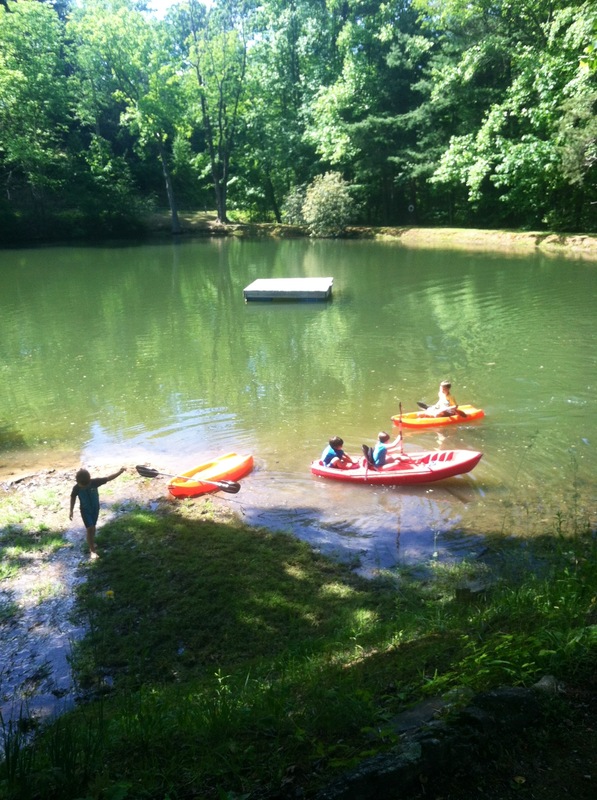 I woke this morning to the sound of kids laughing and playing on the kayaks in our pond. The laughter filled the room. I struggled to move from the comfortable covers and allowed the noise to take me to a place of peace. My favorite sound is laughter. A child’s laughter is the best! In that stillness, water splashing, guests talking and the birds chirping I found a sense of completeness. I have been going and going for weeks now. It feels like I am me again in my piece of heaven. Somehow I have been losing ground with finding time to hike, or just be with myself. Two days ago I sat for hours on our dock, trying to find a way to bring pigment to my skin so I can actually pass for a Latina. The sun and breeze brought me back to stillness just like this morning. Nature devours me intimately. I love this time of year. Stillness speaks volumes. As much as I chit chat (my mouth running all over the place) I need the silence inside to take over, especially during morning time. I tend to forget that during summer time I need to break away every so often and find quietness. I need solitude, recharging my spirit, and finding the Divine echoing through those moments. I often forget how utterly important stillness searches for me to meet in the meadows of serenity. There seems to be a gene in the body that fights the desire to be still. Stillness becomes intolerable. I find, even here in our retreat center, that very few people can sit still for hours. Our minds are constantly directing us to keep busy. For most of us, guilt sets in when we do take time to just be in the moment. Ego turns on the list of things that need to be done. Our culture has been programmed to move from one moment into another without the processing of just letting go. How very sad! On this Saturday, nestled in the mountains of Western North Carolina, the breeze filling the house, I am attempting to just be. It’s a hammock kinda of day, and one filled with laughter from the outside slowly creeping into my heart. Have a wonderful one, y’all! Thank you. Make time, sweetie. Millie, you’re so right about not being to have that quiet stillness. Whether it’s a gene or that we’ve been programmed, it is hard to let go. My best chance of it happens in the morning when there’s that special quiet. It is my favorite time of day when I can experience it. I crave stillness and quiet. A great reminder of the need Millie. Getting rid of the guilt is the tricky part. Oh, how I long to just sit in one of your garden chairs by the pond and just let nature whisk away my cares! It’s the perfect spot to just enjoy the peace and quiet of the morning! I love my fur-kids, but sometimes I wish I could just go out in the yard without them in the morning — just my coffee and me. Callie and Shadow would stay inside quietly, but Ducky’s another story. Oh well. By the way, I can’t remember the last time I felt guilty about taking the time to do nothing at all. I think it’s partially our culture, which values productivity. At least for me, I’m always mentally planning out what I have to do in the short amount I have. But it’s important to stop and be still at times. May you have a day of peace and stillness. It is definitely our culture! I find nature to be my therapist. Thank you for the lovely comment. Have a blessed day! Find stillness. Exactly!! I am thankful for that still space. Wonderful reflection, Millie. Welcome home.